Celtic have confirmed they have held talks with Manchester City defender Dedryck Boyata. The 24-year-old could replace fellow Belgium defender Jason Denayer, 19, who has spent this season on loan to the Scottish champions. Celtic manager Ronny Deila has admitted his interest in Boyata. "We will see if we can make it," he said. "We are talking with a lot of players now, going around trying to strengthen and he is one of them." 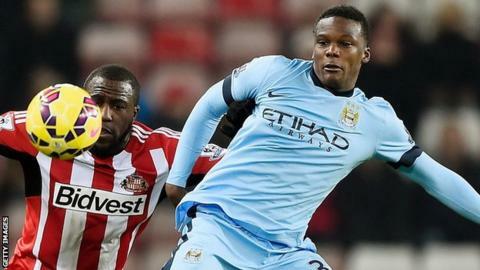 Boyata, who can play in central defence and at right-back, joined the Premier League club as a youth and made his senior debut in 2010. But he has made only 40 more appearances for City's first team in five years, including only five outings this season. Boyata, who earned his one Belgium cap in 2010, has also had loan spells with Bolton Wanderers and Dutch side Twente. He signed a new two-year contract with City last summer, so his switch to Celtic Park would more likely be a loan deal similar to the one that took Denayer to Glasgow. Denayer has become Virgil van Dijk's regular partner at the heart of the Celtic defence and has made 43 appearances this season. However, having made his Belgium debut in March and been named Scottish Professional Football League young player of the year, he will hope to compete for a place in the City starting line-up for the coming season.